Yeah? So we’re live now? Ok, great, thanks. Assuming that there’s even anybody still left out here, just…hear me out. Cause I can explain my little unexpected blogging hiatus that absolutely came out of nowhere and I gave you guys absolutely no warning for. Hey! Have I ever told you all about that time I fell off a merry go round on the playground? No? Story time then. It was lunch time ‘recess’ and one of the games that a group of me and my buddies did was to cram as many of us on the merry go round as we could get. The boys would take turns cranking and spinning the wheel (because it was pretty packed and heavy) as fast as the laws of physics would allow. The ‘object’ of the game really was to stay on the merry go round at all costs- because if you didn’t hang on tight, your behind was gonna get pushed off- the ‘other’ part of the game. Looking back on it, the game sounds pretty dangerous to me now. I mean, any number of unfortunate things could’ve happened; broken limbs, bloody noses, concussions- just to name a few. But it was very amusing to us at the time. There’s something about being a kid where you literally just don’t conceive of anything like that being able to happen to you. I’m somewhat curvalicious now that I’ve reached my adult years, but lemme tell you guys, when I was young, I…wasn’t curvy. At all. My stomach was a garbage disposal and since I had the metabolism of an Olympic athlete, I was just really skinny. I say this to emphasize that during our dare devil game on the merry go round, I was able to really maneuver my way on to the center of the wheel and literally wrap myself through the crannies and bars on the surface, in true contortionist-style. In short, I just usually didn’t get thrown off. But y’know…all good things eventually come to an end. The fateful day came where I wasn’t able to scramble my way to the center of the merry go round and entangle my limbs around the bars, having to content myself with grabbing a spot on the edge of the wheel. It was stupid of me. I shouldn’t have even bothered joining in the game that day. But I did. And I paid the price for it. In case you guys didn’t know: falling off a rapidly spinning merry go round onto a bed of wood chips really, really, really hurts. And it’s also rather embarrassing when you get laughed at by a playground full of other kids for it. Just putting that out there. Where was I? Oh yeah. My point. See the thing is, I’ve been pretty good at maintaining a regular blogging schedule for a while, or so I thought. So long as I was putting out around 2 posts a week, I felt like I was on the right track. Kinda like how for a while, I was pretty good at staying on the merry go round on our recess game back at my old school. But the day came where I just wasn’t as good at the game as I had been before, and I fell off the wheel. Just like I’ve fallen off the blogging horse for the past three weeks or so. I fell off, and I fell hard. It sucked. It was embarrassing. The truth is, I don’t even have a straightforward answer or explanation for you guys as to why it happened. I’ve still been cooking. I’ve still been taking pictures. I’ve put together some new recipes I’m actually rather excited to share. But I just…I just couldn’t get out a friggin post. It just would not happen for me. I’d sit here and stare at my computer screen like an idiot until I finally closed out my WordPress dashboard in self-disgust and clicked over to my Facebook or Twitter tab. I’ve still been keeping up with my Blog Reader feed though: I’ve still been seeing all you beautiful people and all your beautiful posts. And that helped. So here I am. Back with more food. 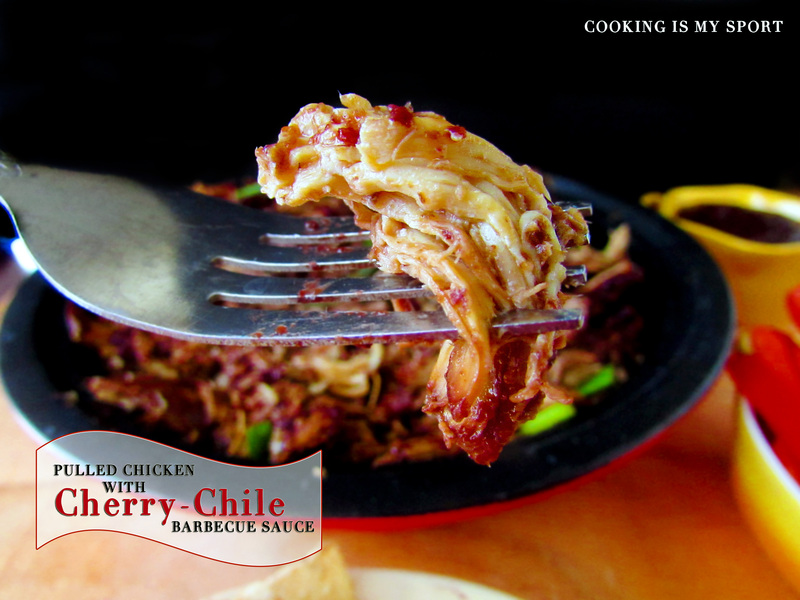 This recipe’s pretty straight forward; chicken breasts you throw in the crockpot with a homemade barbecue sauce of fresh cherries and adobe chiles. It’s your perfect blend of sweet and spicy, and dish you can make when you just don’t feel like being bothered with life. Or you’re a derelict food blogger that needs to get back on the blogging horse…or shall we say, the merry-go round? 1. Heat the oil in a large heavy saucepan over medium-high heat. When hot, add the shallots, ginger, and jalapeño and sauté until softened, about 2 minutes. Add the cherries, tomatoes, molasses, vinegar, chipotle, 1 tablespoon mustard, 3/4 teaspoon chile powder, 1 1/2 teaspoons salt, and 5 grinds pepper, and bring to a boil over high heat. 2. Reduce to a simmer over medium heat, and cook until aromatic and thickened, about 5 minutes. Remove from the heat and carefully transfer half to a blender; purée until smooth, about 20 seconds. Purée the second half until smooth (you should have about 5 1/4 cups). Set aside. 3. Meanwhile, mix 2 tablespoons mustard, 1/2 teaspoon chile powder, 1/2 teaspoons salt, 10 grinds pepper, and the brown sugar in a large bowl; add the chicken and mix well with your hands. 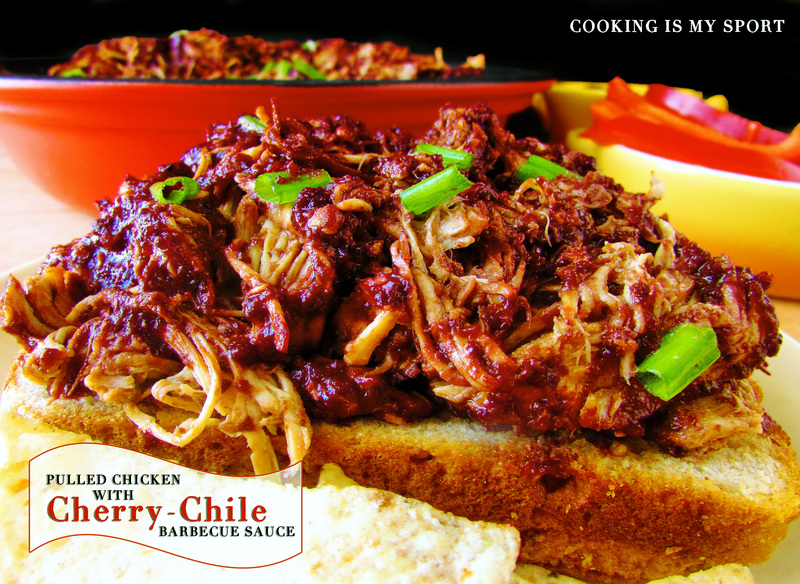 Put the chicken in the bottom of the slow cooker and pour 1 1/2 cups of the barbecue sauce on top (reserve the remainder for serving and extras). Cover and cook on low until the meat is cooked through and tender, 4 to 4 1/2 hours.3. Use tongs to transfer the chicken to a cutting board and carefully use a fork to separate the meat from the bones, discarding the bones (you should have about 4 cups meat).4. To serve, stir together 1 cup of the remaining sauce and the shredded meat, and reheat in the microwave or on the stovetop. Whoa!! Drool, drool Jess!! That chicken looks to die for! And sorry about your not so merry accident! Good to see you back and blogging Jess! 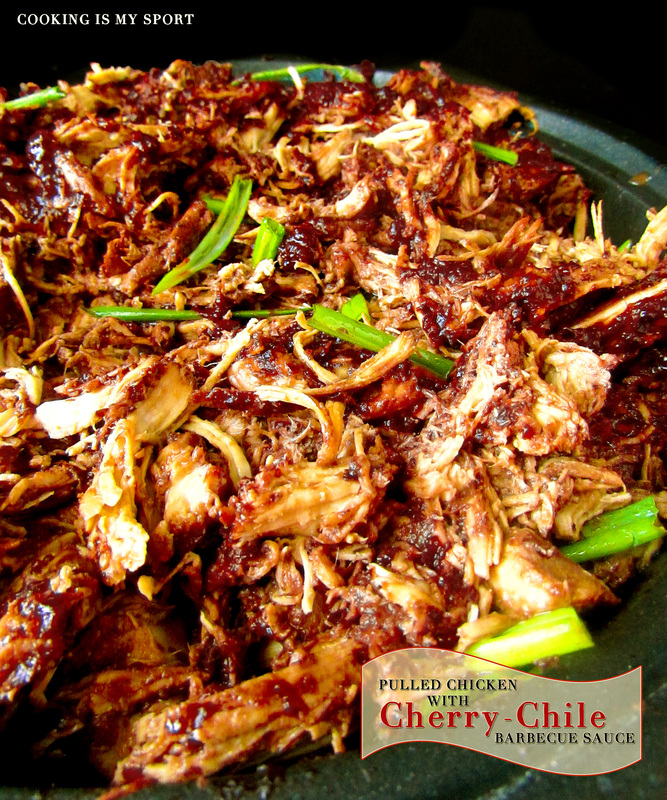 I feel like we all need a little break now and then 🙂 I love that this pulled chicken recipe has a little kick to it, adobo chiles are one of my favorites for adding depth of flavor. Thanks Heather- it feels good to be back! 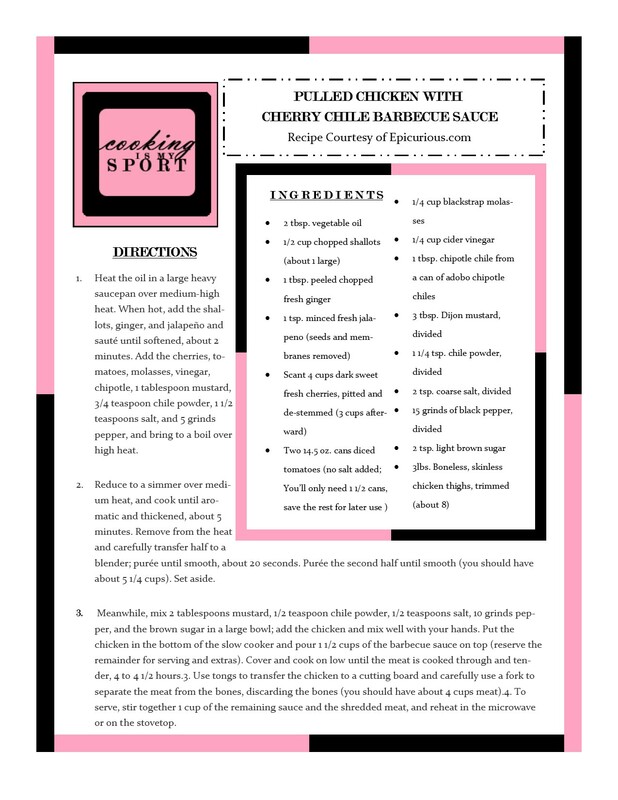 Just so you know…this recipe looks AMAZING, and I, too, was the skinny kid…until I wasn’t…and that unexpected blogging hiatuses are a part of life. 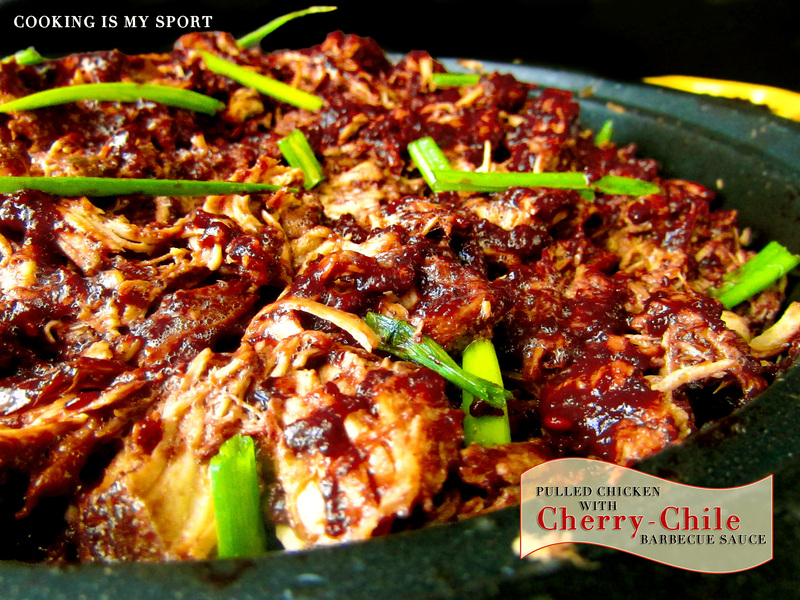 Glad your back and blogging more delicious looking recipes 🙂 I’m drooling over the cherry chili BBQ sauce. It looks amazing! 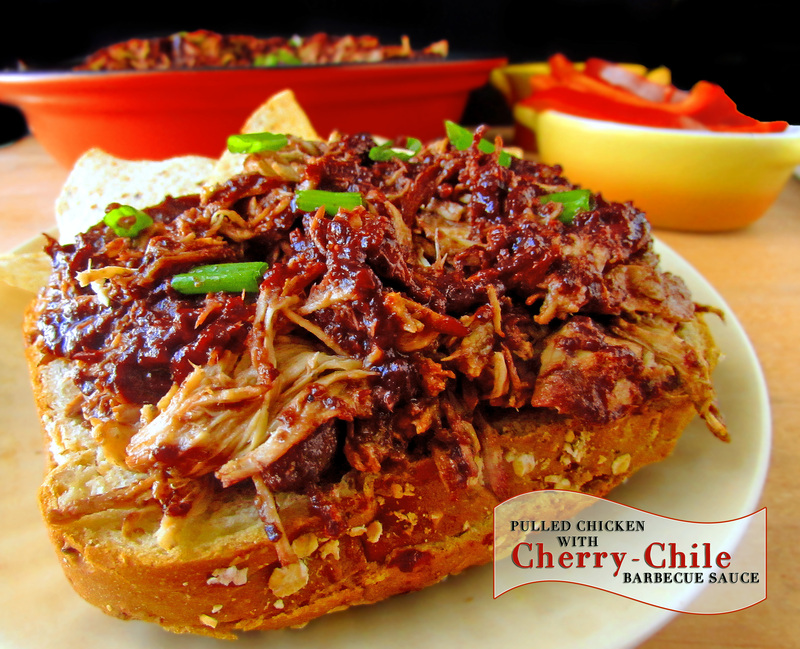 Welcome back, loving that BBQ sauce, cherries and chili’s what a great combination, The chicken with that sauce is really nice, bet it would be great slathered on the chicken (pork too) and throw on the grill. Happy FF#60. Hi!! Wow that chicken looks fan-freaking-tastic 😀 I need that in my life! Welcome back, we all need that break from time to time. This is very attractive and delicious! The things we do as kids are not sensible when we look back at it from this end. But that is the fun of being a kid and we miss it now! Thanks Lily, you have a great one too! Glad to see you back! This chicken dish looks wonderful! Welcome back and with such a decadent dish for your triumphant return! My stomach just growled. 😀 I hope you could send me some? Jess, this chicken is making me so hungry…. I wish I could reach and get some of that delicious pulled chicken. Looks absolutely awesome!